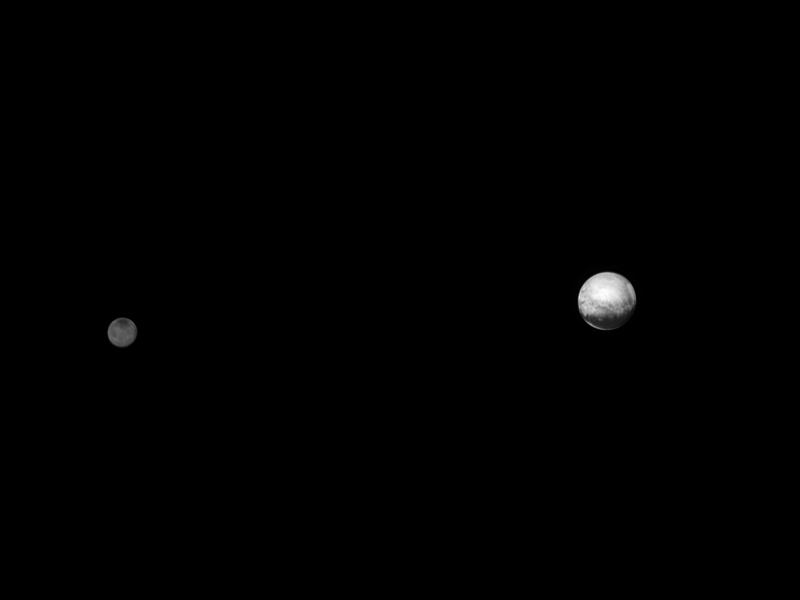 Pluto and Charon, photo taken by New Horizons on July 8, 2015 from a distance of 6 gigameters. 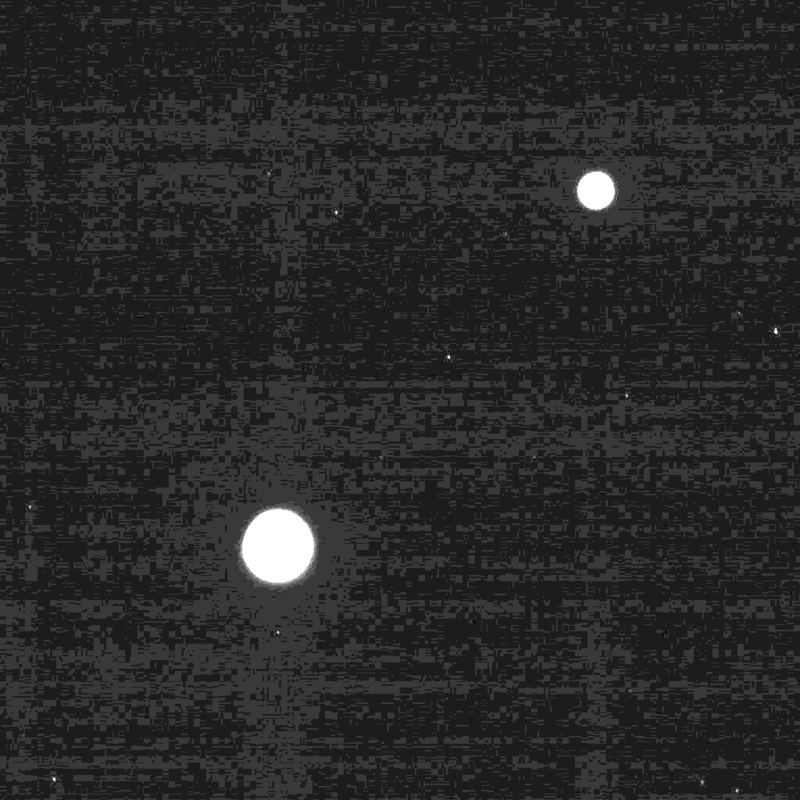 It's hard for me to believe there were no stars behind the twin dwarf planets in the field of vision. I also would not expect the planets to be illuminated so brightly (how many zillion of kilometers are they away from the sun?) that it washes out the stars. Is it because of a time exposure and movement of the spacecraft? But then why is the detail on Pluto not smeared away? The sun is still surprisingly bright at Pluto. While it is approximately 1500 times less bright than at Earth, this is still approximately 250 times brighter than a full moon. If you consider the effect the difference between a full and new moon has on star viewing I expect that the reflected sun at Pluto is still bright enough to make it difficult to see any stars, without saturating the view of the planets. You can look up the camera settings behind these images. Here is the link to one of the raw images. The exposure time of the camera was 100ms. New Horizon's LORRI camera is a Ritchey-Chrétien telescope with a 20.8 cm diameter primary mirror and a focal length of 263 cm. That gives us approx. f12.6, which is a rather long i.e. fairly slow optical system (but typical for an astronomical instrument). The CCD in this camera probably makes somewhat up for that by being a little more sensitive than the average digital camera chip (that's maybe worth 1-2 f-stops). It's also a panchromatic camera (science-speak for black-and-white), which buys us another couple of f-stops in sensitivity over a CCD with built in RGB-filter, so that we are roughly dealing with the equivalent of an f8.0 or so consumer camera. Now you can get your digital camera, set it to some reasonable gain (i.e. ISO 400) where the readout noise isn't dominant, yet, and take a picture of the night sky at f8.0 and 1/10th of a second exposure. Are you going to see stars? Probably not. I did take a couple pictures of the full Moon the other night. The ideal setting was ISO100, f/6.5 and 1/200th second. No stars... for those I have to use ISO1600, f/4.5 and 30 seconds, i.e. conditions which gather a thousand times more light and which amplify the signal electronically to get the dimmer stars to show up somewhat. If I wanted a (fake) image with Moon and stars I would have to photoshop the two together. That is exactly how all the pretty Hollywood movies do their astro-shots: it's image manipulation and cgi. Not the answer you're looking for? Browse other questions tagged visible-light astronomy camera or ask your own question. Why aren't pictures of Pluto darker than those of other planets? How many percent of the visible light reaching the Earth are from other stars than the Sun? Why stars twinkle but planets don't? What are the demographics of stars visible to the naked eye? Of the 9096 visible stars — 90% are how close? What is this blue thing in a photograph of a bright light? Why are transparent objects visible? Are there stars that wouldn't look white to the naked eye? Are there any materials which are transparent only to some wavelengths of visible light?